Our 1000d Cordura, padded saddle bags are made to be used alone, or with an 18"x8"x14" ammo box. The special gusseted ends make it possible to remove the lid of the ammo box without lifting the whole box out of the saddle bag. 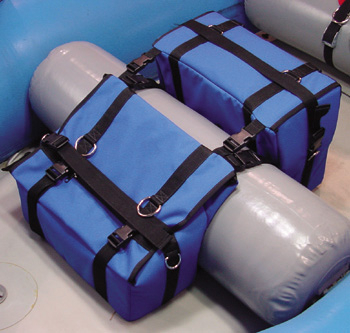 Sewn-on straps can be used to secure the bag to any sized seat thwart.